On Saturday, April 8 th Warren County Technical School sent 80 students to the 2017 SkillsUSA State Championships at the Garden State Exhibit Center in Somerset, NJ. Students represented their chosen shop programs in various skills based competitions, and Tech came home with 35 medals. 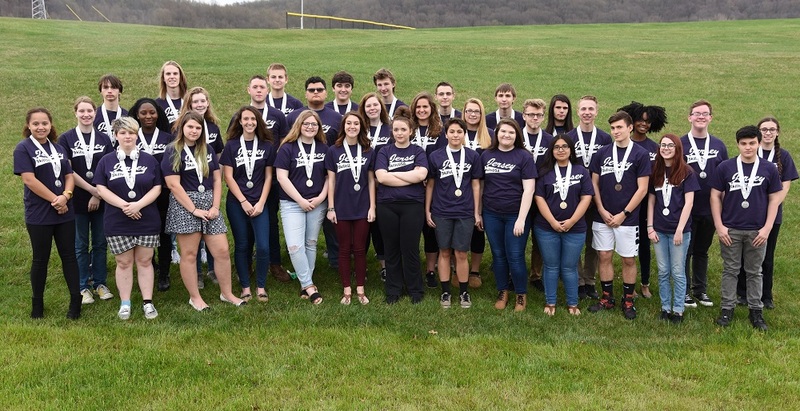 Eight students earned state championships, 21 students earned silver medals, and six students earned bronze medals. Sophomore Nick Hufford also ran for the Skills USA State Office Team and was elected to the position after having previously served as a Regional Officer. Sophomore Lily Mendoza earned a State Championship in Advertising Design while juniors Jennifer Cirilo, Amber Francy, and Harmony Hunt earned gold for Career Pathways Showcase, Education and Training. Sophomores Nick Hufford, Jack Lukashonak, and Nathanael Morris earned the honors for Career Pathways Showcase, Manufacturing, and Senior Collin Patricia earned the State Championship in Firefighting. SkillsUSA is a vital solution to the growing U.S. skills gap. This nonprofit partnership of students, instructors and industry ensures America has the skilled workforce it needs to stay competitive. Founded in 1965 and endorsed by the U.S. Department of Education, the association serves more than 300,000 member students and instructors each year in middle schools, high schools and colleges. This diverse talent pipeline covers 130 trade, technical and skilled service occupations, the majority STEM-related. More than 600 corporations, trade associations, businesses and labor unions actively support SkillsUSA at the national level. SkillsUSA programs are integrated into career and technical education through a framework of personal, workplace and technical skills grounded in academics. Local, state and national championships, designed and judged by industry, set relevant standards for career and technical education and provide needed recognition to its students. SkillsUSA also offers technical skill assessments and other workplace credentials. For more information, go to: http://www.SkillsUSA.org .